Kids love balloons! 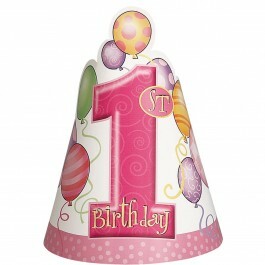 This makes a 1st birthday balloon theme party a superb idea for your little one. 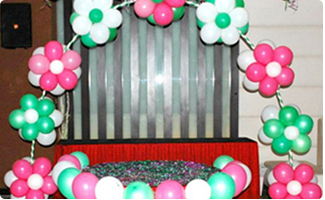 So if you are looking for balloon party ideas in India, we have a selection of great balloons, 1st birthday party supplies, return gifts, and amazing decor and cake ideas, helping you put together a birthday party that will provide countless wonderful memories for you all. Keep in mind that planning a balloon themed birthday party is a lot more for you, the parents, than it is for the enjoyment of your little one. While your baby is sure to enjoy his 1st birthday balloons, his attention span and memory simply won't make it possible for the baby to enjoy or remember much of it. 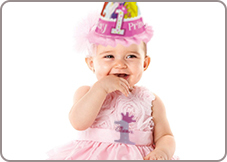 To make it as special as possible for your baby, you should ensure baby is feeling his/her best for the party. Do this by not scheduling the party around his/her morning or afternoon naps. Keep the guest list short and sweet to avoid overwhelming your baby on his big day. Just a few close friends and family members should be all that you need to celebrate this milestone birthday. If the weather will permit it, consider hosting the party on your patio or at a local park. Your local YMCA or community pool will also offer plenty of outdoor space. 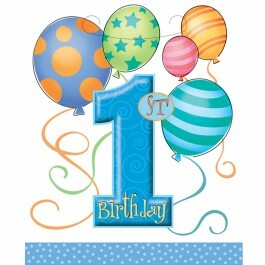 A package of 1st birthday balloons invitation will make writing and sending out the invitations a snap. Pick up a package, along with some thank-you cards, and you're all set to get those invitations in the mail. Some blue poster board, markers, paints, glitter, and ribbons will help you create your own balloon invitations. Cut out balloon shapes and tie pretty ribbons to the bottom of them. Decorate the balloon invitations with glitter, die-cut number ones, and perhaps a sweet poem about your darling turning one. 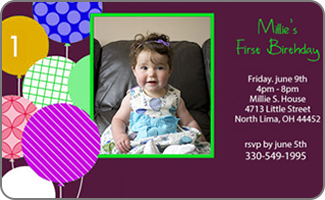 A plush balloon is a fun idea to attach to a birthday invitation. They can be purchased from many party supply stores, or with a bit of felt and some stuffing, you can create your own. Have your baby's one year old portraits snapped a bit early and have him holding a bunch of balloons in the image or you can make balloons using construction board as shown in the picture. These can then be turned into invitation cards or be included with standard birthday invitations so that your friends and family can have a keepsake of your little one. If you have a preference for birthday gifts, or would prefer no gifts be purchased then be sure to note it on the invitations. One year olds have somewhat limited abilities to play party games, but any games and songs that get them interacting with one another and with their parents is a good idea. Peek-a-boo and other favorite games will delight them all. Fill a kiddy pool with plastic balls for the little ones to play in. This can be enjoyed both indoors and outdoors if the weather is agreeable. A bubble machine and a selection of bubble wands will entertain the little ones with lots of shimmery bubbles, and also tie in nicely with your balloons party theme. Coloring pages and non-toxic toddler-sized crayons will keep the little ones busy. 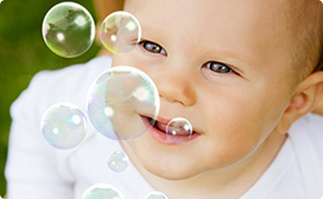 Provide a selection of age-appropriate toys to keep the babies all entertained. From musical toys to board books, there are a lot of things that will keep them happily playing while the adults socialize. Pick out a few age-appropriate return gifts that include sunglasses, beads, toy cars, bouncy balls, dinosaurs, and bubbles. 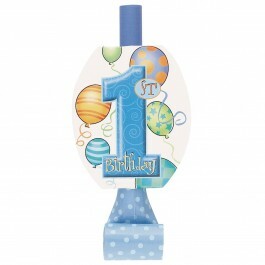 Coloring books and stickers are also fun choices for your balloon themed birthday party. A plush animal or toy is appropriate for the age group, just be sure to select something in blue or perhaps a teddy bear holding balloons. A few blue balloon shaped and decorated sugar cookies will provide a fun snack for later. 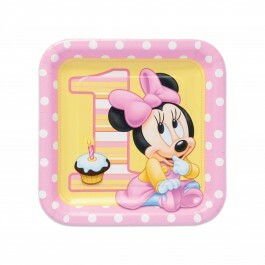 A DVD of a favorite movie or TV show will provide entertainment long after the 1st birthday balloons party has wrapped up. Lip-gloss, mirrors, combs, and water squirt pistols are good choices, for added style, just pack them into tiny gift boxes in blue color. No balloons party would be complete without a balloon-shaped birthday cake. 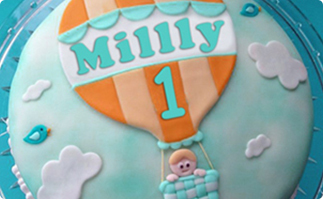 Whether one balloon or a bunch of pretty balloons, the cake can be topped with a selection of 1st birthday candles that are fitting for the theme. Cupcakes are fun for a first birthday balloons party, because then every little guest can get his or her own cake to smash and enjoy. Offer a selection of sliced fruits and soft vegetables. You could even use a melon baller to create perfectly round slices of fruit for the little ones to enjoy. Simply poke a few lollypop sticks through them and you have balloon-themed fruit snacks. Pizza, hamburgers, deli sandwiches, and a selection of chips and dip all make a great addition to the party. Not only will the little ones enjoy it, but the adults are sure to appreciate the selection to suit their palate. The Queen of Hearts jam tarts aren't just fun! They will be a nice and tasty addition to the party. Remember to add little labels for each thing served so that guests can wholly understand the tie-in with the movie. Cover the party table with colorful balloons & confetti, place a toy as a centerpiece and even placing some adorable tissue paper pom pom in different shapes like flower and ball is a great idea. 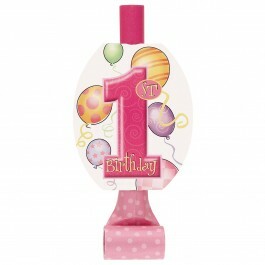 With a balloon themed birthday party your obvious first shop for 1st birthday party decorations should be plenty of balloons. 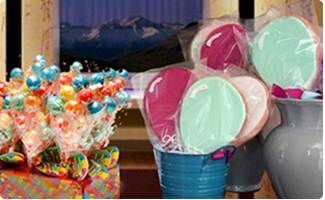 A selection of both Mylar and latex balloons will ensure that your party theme is firmly in place on the big day. Tie a selection of blue and white balloons or balloons of any color to your mailbox or an outdoor shrub so arriving guests can easily spot your driveway. Decorate the party space with lots of balloons, including tying balloons to each chair and high-chair to make the birthday kids feel special. 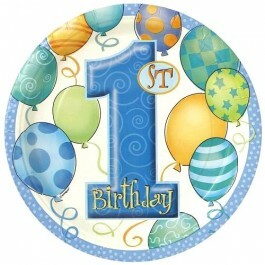 If you are looking for unique first birthday balloon decorations in India, you can explore our collection. 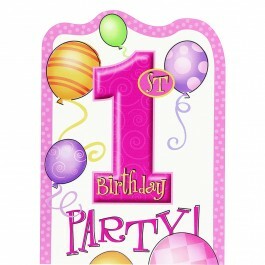 Some fun 1st birthday party decorations also include vinyl clings that can be placed on walls, windows, or glass doors. Place cutouts of balloons on walls and doors to continue the balloons party theme! Decorate the party tables with balloon-themed tablecloths, or opt for a solid blue tablecloth. 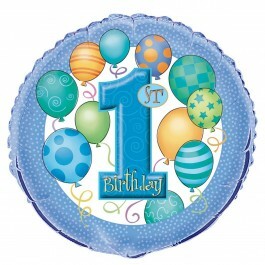 Create a centerpiece using balloons and other 1st birthday balloons themed items. 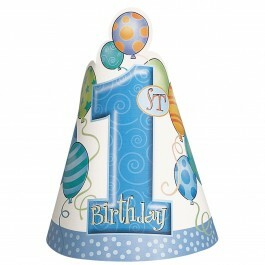 Don't forget the balloons party hats, paper plates, napkins, cups, and other goodies all tying in nicely with your theme.